Disability Blog Carnival #27.... ? As some of you may have noticed, there was supposed to be an edition of the Disability Blog Carnival at Astrid's Journal last Thursday. It's not there, and I've emailed Astrid, but I didn't get any reply--so I'm not sure what happened, or if the edition will post at some future time. I hope Astrid is okay, and I'm sure we'll be in touch eventually and figure it all out. In the meantime, let me say that the next edition of the Disability Blog Carnival will be hosted at Andrea's Buzzing About, with the theme "A Few of My Favorite Things," on 13 December. You can submit links for consideration at the blogcarnival.com form, or in comments here, or at Andrea's blog. The 19th Floor (Mark Siegel): "Is it me, or does it seem really fucked up to use the same financing scheme for both the purchase of a flat-screen TV and a three-day stay in the hospital for a burst appendix?" A Deaf Mom Shares Her World (Karen): "Kudos to Potbelly for committing to an accessible design for all their restaurants-- even if it took a lawsuit to make it happen. Now let's see them hire people with disabilities as well!" Andrea's Buzzing About: "Die-hard patriots will strenuously assert that the US is the 'greatest nation to live in', but the World Health Organization would beg to differ..."
The Gimp Parade (Kay Olson): "It's a colorful painting of an Indian woman or girl in a manual wheelchair wearing a pink and green sari and traditional Indian jewelry. The spokes of the wheelchair have "virtues" written along them..."
Keep Buggering On! (Lorraine Hershon): "This weekend I was having a cup of tea with some casual acquaintances when they suddenly said, Do you mind if we pray for you? Well what can you say to that?" L'azile (Catherine Roy): "...it seems to me that we should not have to point out, in this day and age, that just because you use a wheelchair, that does not mean you can not think for yourself or how disheartening prejudice or lack of access can be. Don’t people get it by now?" The Life and Times of Emma: "When the guy from the journey care booking line went 'so that’s a booking for you and your electric wheelchair to travel to Oxford…' as though my powerchair was another person." Midlife and Treachery: "Sometimes, our lives are just too different to look across that divide of privilege and make any kind of sense." Miss Crip Chick's Weblog: "We are taught to think disability activism means being that one token young person on every single board and committee in the country." Pipecleaner Dreams: "...what I thought was only a problem with school is actually a problem with everything. Corey's mind works in ways that are hard to figure out. And it's probably just as frustrating at times for him as it is for me." Pretty Good Considering (Jothy Newton): "Soldiers in Iraq have required an amputation at twice the rate compared to previous wars." Reimer Reason (Jodi Reimer): "Kellen had a blast with his cousins. As he has gotten older, they have been playing a bigger role in his life." Rollingpix (Ralph Raymond): "I was really stoked to get the second interview with Greg Malory after his historic, successful navigation of the Mangde Chu river in the Himalayan Mountain ranges of Tibet." Screw Bronze (Elizabeth McClung): "See, I am finally starting to get what having an autonomic dysfunction means. It means that things just happen. Indeed, no one really knows for sure WHAT happens or why." Through Myself and Back Again (lilwatchergirl): "I've had meetings with managers in which I've asked for reasonable adjustments that would cost nothing and bother no one, but because they're a variation on the norm, or mark me out as a different, they've been refused...."
Wheelie Catholic (Ruth Harrigan): "Like car owners, wheelchair users need regulations to ensure we get the products we need and the performance we want." Autism Vox (Kristina Chew): "As I grew older, I started to see how, for me—a third-generation Chinese American—-what was 'Chinese' and what was 'American' were often intertwined, and that being American could mean a lot more than apple pie and the Mayflower. So 'normal' has always been a flexible category for me... "
The greatest source of inspiration is hard work. Of course, I also believe in inspiration itself, but sometimes you have to provoke it, call on it repeatedly, even though it may take a while. Born on this date in 1901, Spanish pianist and composer Joaquín Rodrigo Vidre (pictured at right, as a young man), in Sagunto, Valencia. He was blind from age three, after surviving diphtheria. Young Joaquín attended a school for blind children in Valencia, where he learned braille. He later studied music in Paris. He first achieved fame at the age of 23, when he won Spain's National Prize for composers. 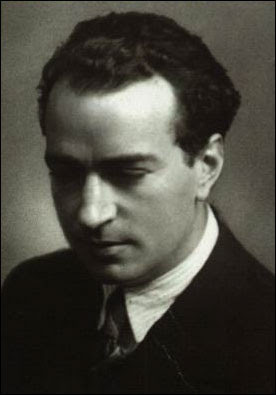 Rodrigo is best known for his compositions for guitar, including "Concierto de Aranjuez" (1939). Miles Davis adapted part of this concerto for "Sketches of Spain" in 1960. There are YouTube video clips of the concerto being performed more traditionally here and here. Rodrigo married fellow pianist Victoria Kamhi, and they had a daughter, Cecilia (b. 1941). He held the Manuel de Falla Chair in Music at the University of Madrid. Today, there is a Joaquin Rodrigo International Competition, held every two years in Madrid. The 2008 competition is for piano and violin performances; the 2010 competition will be for guitar and voice. On November 3 this year, his work (including the Concierto de Aranjuez) was included on the Discoveries radio program, marking the 2007 Festival of Disability Arts and Culture in Philadelphia. What did actresses Dorothy Dandridge (1922-1965) and Gene Tierney have in common, besides being considered among the great beauties of their generation? Both November birthdays. Both were directed by Otto Preminger in well-known roles (Carmen Jones, and Laura, respectively). Both women, in 1943, had daughters born with significant developmental disabilities. And both women's later lives were emotionally tumultuous. These latter two facts are often linked in brief biographies, whether or not they should be, just because that's the easy story. In fact, the pressures and temptations and health issues they faced were sure more a part of the general dysfunction of Hollywood life, with or without their daughters' disabilities. I wonder if they ever knew each other--if they ever knew how much they had in common? 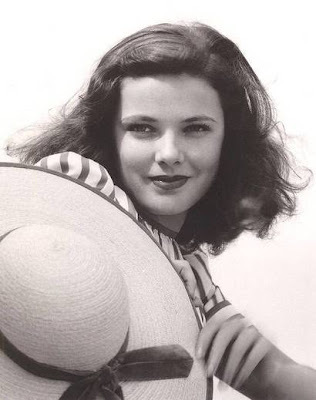 Gene Tierney (1920-1991) described her lifelong experience of bipolar disorder in her 1979 autobiography. She was institutionalized on and off through her thirties--not unlike yet another Hollywood beauty, Frances Farmer (1913-1970), had been a decade earlier. In her autobiography, she declared, "I have been subjected to electric shock treatments that deadened my brain, stole chunks of time from my memory, and left me feeling brutalized....Pieces of my life just disappeared." Tierney married her second husband in 1960, and more or less retired from making movies. She died in 1991, from emphysema (she had begun smoking at the beginning of her career, to lower her voice for film roles). Just in case Julia Roberts reads our blog (ha!). Today is the 62nd birthday of Wilma Mankiller (picture at right), the first woman to serve as principal chief of the Cherokee Nation. By the time she took office in 1985, she was also a disabled woman: a serious car accident in 1979 nearly took her leg. She underwent seventeen surgeries to reconstruct it, and says "to this day, I am not sure how I managed to regain mobility." Then in 1980 she was diagnosed with myasthenia gravis, a chronic neuromuscular condition. While she was Chief, she received a kidney transplant, after decades of kidney trouble (she had a second kidney transplant in 1998, the same year she was awarded the Presidential Medal of Freedom). 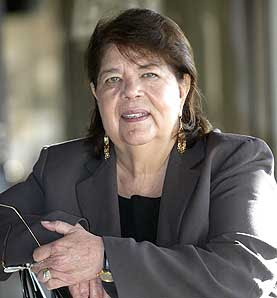 Mankiller resigned from her position in 1995 after a cancer diagnosis. She lives on her ancestral allotment with her husband, not far from her daughters and grandchildren. The "Enabling Spaces" Curriculum, and "Access to Admissions"
Last summer I [Mike Dorn] had the pleasure of working with a group of Philadelphia high school students calling themselves Project Beta. They were participating in an afterschool enrichment program calls bITS, funded by the National Science Foundation and hosted by Temple University's Information Technology and Society Research Group. While exploring high end Web 2.0 applications, students were challenged to derive insights from the fields of science, technology and mathematics to solve problems that were familiar to them in their everyday lives. Carol Marfisi and I provided the topical introduction to the themes that students would be exploring during the week-long model, "Towards Enabling Spaces?" Project Beta's explorations of the Temple University campus from the perspective of a person using a wheelchair produced the hilarious film entitled "Access of Admissions," since posted to YouTube and Temple University's site on CampusVid. I am so impressed by the work of Geography and Urban Studies graduate student Langston Clement and the entire Project Beta team. I hope you enjoy it, and are inspired to undertake similar explorations of your university campus! Feel free to contact us through the email link to the left, and we will put you in touch with the right people. Of course, you won't be able to duplicate that irresistable Philly soul sound! The television writers are on strike. This is national news, I realize, but it's also local chatter here--I drive past the picket line at Raleigh Studios Manhattan Beach some days, it's only a mile or two from my house. I was talking to a striking writer at a small dinner gathering last night, and an assistant director who's also affected. That's LA for you. But one show's writers probably shouldn't rush back to work--if recent episodes are any indication of their mindset. Cilla Sluga at Big Noise explained what was wrong about last week's mess on ER: an episode in which a doctor and a young teen decide the kid (who has a terminal illness) shouldn't live any longer, so they lie to the kid's mother about treatment options--and this is presented as a noble gesture on the doctor's part, not as gross malpractice. One character objects, but doesn't go farther than voicing her objection. (And as Sluga further reveals, the episode was written by an ER doctor at Children's Hospital LA--a scary twist to the story.) In this week's episode, William Peace at Bad Cripple catches another doozy: a wheelchair user is the tired "bitter cripple" stereotype, complete with lines like "anger is my baseline" (which would make a fine t-shirt, but as a summary of a disabled character, ugh). One implication of his storyline is that he can't be a good parent because, uh... because he can't clean the gutters. What? It wasn't always like this: ER has in the past done much better by the disability community. Characters with physical, mental and sensory disabilities have been presented as rounded human beings with full civil rights, at least as well as any other 44-minute network TV drama has done (admittedly, that's a low standard to achieve). One highlight was a 1998 appearance by Neil Marcus, which was about showing disablist assumptions for the dangerous errors they are.... not about confirming those assumptions for viewers. I hear that this is ER's last season. Maybe that's for the best. UPDATE 12-7: William Peace notes that the 300th episode (much hyped, aired this week) was also cringe-worthy. With the incarnate wages of man's sin. Ever have one of those days, where your projects follow you around? It's a nice day out, so I went for a walk, after a morning of writing disability history encyclopedia entries (on Blind Boone and Anna Klumpke, in case you're curious). But disability history followed me out the door anyway. On my iPod, a recent episode of the podcast Coverville noted Porter Wagoner's recent passing with his rendition of Johnny Cash's "Committed to Parkview"--a striking country song, originally released in 1976, about being institutionalized in Nashville (both Cash and Wagoner had spent time as patients at the Park View facility in the 1960s). Kay at Gimp Parade sometimes posts videos and song lyrics with disability themes, but I don't think I've seen this one in that series. (It is, however, in this list.) After the video, I'll include the lyrics. Video Description: Wagoner is singing almost a cappella, with brief, silent, sometimes slow-motion scenes of institutional life interspersed. Wagoner is in some of the scenes. I have so many things in me that you can't even guess them all. Kim Peek, American "mega-savant" and one of the real-life models for the Raymond Babbit character in Rain Man, turns 56 today (November 11). He seems to have a variety of diagnoses and labels, but he also defies prognoses and assumptions. There's an hour-long documentary about him, available in five parts (uncaptioned) on YouTube. The narrative arc of the film follows Peek and his father on a trip to some medical specialists, so it's pretty focused on his unique neurology. And there are a lot of clips of his public appearances, where Peek's answering trivia questions about dates and baseball. But it still gives a picture of his personality, his history, his relationships (especially with his father), and plenty of direct commentary from Peek, so it's not just talking about him. Disability Blog Carnival #26 is up NOW! Greg at Pitt Rehab collected posts in answer to the subject "how do you relax, unwind?" for the latest edition of the Disability Blog Carnival--if you need some new ideas for enjoying downtime, you'll surely find them among the links this round. Next edition of the Disability Blog Carnival will be hosted at Astrid's Journal, and the invited theme is "Transitions." Should be plenty of room for interpretation there! Deadline for submissions is Monday, November 19, and the carnival will post the following Thursday, the 22nd. That's Thanksgiving Day in the US, so American readers will have to take a break from football and turkey to come join the carnival. (Yes, I've just given you an excuse to get away from the holiday fuss. You're welcome.) You can submit links for consideration at the blogcarnival.com form, at Astrid's blog, by email, or here in comments--we'll catch you somehow. November 8: Happy 16th Birthday, Aaron Fotheringham! I don’t think of it as practice, I think of it as a fun way to live my life. Julio Villanueva Chang's "Through the Eyes of a Blind Mayor" (pp 15-37) is a profile of Apolinar Salcedo (pictured at left, in ceremonial sash and other signals of his office), the mayor of Cali, Colombia, who lost his sight in a childhood accident. He attended the Cali Institute for Blind and Deaf Children, and became a lawyer before going into city government. Ever since a Buenos Aires magazine called 7 Dias published a feature story on on Aicuña's albinos in the early eighties, the town's inhabitants have been wary of the press. The story's effect was immediate and, for them, unwelcome. People began to arrive hoping to meet albinos. They wanted to see them, photograph them, find out what they were like and how they looked, to discover what daily life was like in the town they imagined--one filled almost entirely by people with white hair and translucent skin... Ever since then the town has been protective of the albinos who live there, and evasive, even surly, towards outsiders. Neither of these stories is written with explicit reference to disability culture or politics (and the latter author admits that he's asking exactly the prying questions that the townspeople detest), but they're well-written and worth checking out.